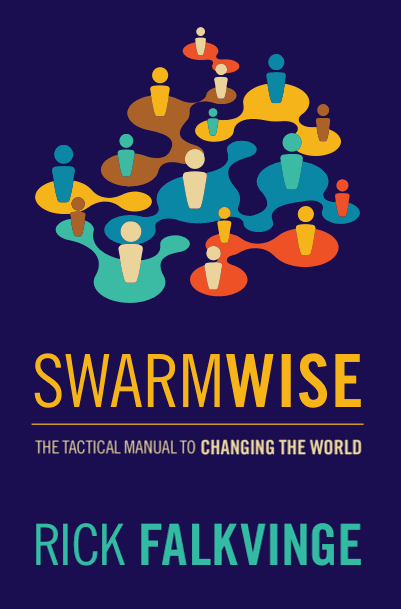 Home › Activism › Swarm Management › Swarmwise – The Tactical Manual To Changing The World. Chapter One. Somewhere today, a loose-knit group of activists who are having fun is dropkicking a rich, established organization so hard they are making heads spin. Rich and resourceful organizations are used to living by the golden rule — “those with the gold make the rules.” New ways of organizing go beyond just breaking the old rules into downright shredding them — leaving executives in the dust, wondering how that band of poor, ragtag, disorganized activists could possibly have beaten their rich, well-structured organization. On June 7, 2009, the Swedish Pirate Party got 225,915 votes in the European elections, becoming the largest party in the most coveted subthirty demographic. Our campaign budget was fifty thousand euros. Our competitors had spent six million. We had spent less than 1 percent of their budget and still beat them, giving us a cost-efficiency advantage of over two orders of magnitude. This was entirely due to working swarmwise, and the methods can translate to almost any organized large-scale activity. This book is about that secret sauce. Working with a swarm requires you to do a lot of things completely opposite from what you learn at an archetypal business school. You need to release the control of your brand and its messages. You need to delegate authority to the point where anybody can make almost any decision for the entire organization. You need to accept and embrace that people in the organization will do exactly as they please, and the only way to lead is to inspire them to want to go where you want the organization as a whole to go. It is only as you release that control, the kind of control that organizations and managers have held close to heart for centuries, that you can reap the benefits of the swarm: the same cost-efficiency advantage and execution-speed advantage against the competition that the Swedish Pirate Party enjoyed. This book will teach you those methods, from the initial forming of the swarm to its growth and ongoing maintenance and delivery. It will not teach you the underlying theory of psychology and sociology — merely share experiences and methods that have been proven to work in practice. When I kick-started the swarm of the Swedish Pirate Party, I had posted a rough manifesto on a rather ugly website and mentioned the site just once in a chat channel of a file-sharing lobby. That was all the advertising that ever happened; the next day, the party had hundreds of activists. Timing, social context, and message are crucial – but if you have those three, your initial swarm will form like bees to honey in hours. Growing it and maintaining it will also be crucial, but those are the next challenges in line. We take one challenge at a time. As we describe the swarm concept, it is easy to think of pure decentralized amorphous clouds of people, like Anonymous or the Occupy Wall Street movement. However, while these swarms share values, they do not share direction or method. That means they are confined to succeeding on small projects that span a relatively small number of people over a relatively short time span, even if each of those small projects builds gradual awareness of the Anonymous or Occupy brands. The weak cohesion of the Anonymous and Occupy brands can partially be ascribed to their choice of being leaderless. While this brings resilience, as no leader can be targeted by adversaries, it sacrifices direction and purpose. I’ve found that the typical Internet community methods of inclusion, when combined with strong leadership, work much better to achieve global change than working leaderlessly under little more than a common flag. I learned some of these techniques while being trained for officer’s rank in the army, and even more of them by participating in many online communities. But the secret sauce recipe of swarm cost efficiency was hit only when I took an officer’s training in maintaining strong group values, mixed in the net’s strong participatory values and low-cost mass communication, and added a dash of management experience from the dot-com era at the turn of the century. Therefore, this experience carries over directly to working with volunteers, where people don’t work for the money either (as they aren’t getting any). Leadership and positive reinforcement are key. This sets it completely apart from a traditional corporation or democratic institution, which focuses sharply on what people must do and what bounds and limits they are confined to. This difference is part of why a swarm can be so effective: everybody can find something he or she likes to do, all the time, off a suggested palette that furthers the swarm’s goals — and there is nobody there to tell people how things must or may not be done. Rather, people inspire one another. There are no report lines among activists. As everybody communicates with everybody else all the time, successful projects quickly create ripples to other parts of the swarm. Less successful ones cause the swarm to learn and move on, with no fingers pointed. If you want leadership in a swarm, you stand up and say, “I’m going to do X, because I think it will accomplish Y. Anybody who wants to join me in doing X is more than welcome.” Anybody in the swarm can stand up and say this, and everybody is encouraged to. This quickly creates an informal but tremendously strong leadership structure where people seek out roles that maximize their impact in furthering the swarm’s goals — all happening organically without any central planning and organizational charts. At the bottom line, what sets a swarm apart from traditional organizations is its blinding speed of operation, its next-to-nothing operating costs, and its large number of very devoted volunteers. Traditional corporations and democratic institutions appear to work at glacial speeds from the inside of a swarm. That’s also why a swarm can change the world: it runs circles around traditional organizations in terms of quality and quantity of work, as well as in resource efficiency. A key aspect of the swarm is that it is open to all people who want to share in the workload. Actually, it is more than open — everybody in the whole world is encouraged to pick work items off a public list, without asking anybody’s permission, and just start doing them. There is no recruitment process. Anybody who wants to contribute to the goal, in his or her own way and according to his or her own capacity, is welcome to do so. This contrasts sharply with hiring processes at traditional organizations, where people have to pass some kind of test in order to start working for the organization. The advantage of this approach is that resources of the swarm aren’t spent keeping people out of it, but are spent getting people in to it. Granted, some work will be a duplication of effort since many people will be working on the same thing when nobody gets to tell other people what to do — but the result will be several solutions that are tried in parallel, and the swarm quickly learns which solutions work and which don’t. The workflow becomes an iterative, evolutionary process of trial and error, of constantly adapting and improving, without anybody’s supervision to make it happen. Transparency is also effective at preventing scandalization: there have been several instances in the Swedish Pirate Party where media caught wind of a conflict and sensationalized it in a typical tabloid fashion, at which point a normal organization would have capsized — but since everybody reading the stories was able to go to the source and read the actual and original exchange of words, there were no rumors, and there was no “he said, she said.” Conflicts do not escalate beyond control when this transparency is in place. Of course, this doesn’t mean every discussion over coffee or a drink must be recorded. That would create an untenable workload, and couldn’t be enforced anyway. But it does mean that work isn’t applied to keep some people away from information that is available to other people — so when discussions are held online, they remain recorded and they remain readable. In the few cases where secrets are kept, they are to protect the privacy of people in the swarm, and anybody can easily find exactly what information is kept secret — and, more importantly, why it is kept secret and who has the knowledge of it. An example of a legitimate secret in a swarm could be the identities of donors, in order to protect the donors and prevent conflicts of interest as people would consciously or subconsciously try to please the larger donors rather than work toward the overall goal of the swarm. The person administering the bank account and/or credit card records would know this, but would be tasked with keeping it to himself or herself. Last but not least, being fully transparent alleviates the problem in traditional chain-of-command structures where somebody in the middle may distort information passed up or down, either consciously or subconsciously, in the scenario where every link in the chain is an information bottleneck. By making all the information available to everybody, nobody will have the ability to distort it to parts of the organization. Conversely, nobody speaks for other people in a swarm, as everybody has his or her own voice. This prevents factionalization, as there aren’t any traditional middle managers who can set their own goals that conflict with those of the overall swarm. You are probably reading this book because you have one or a couple of provocative ideas lurking in the back of your head and are looking for ways to realize them. Here, then, comes the boring part of realizing them: have you done the math? All swarms are a matter of quantity. Quantity of people. Like army ants in the Amazon rainforest, it is a matter of overpowering your opponents with sheer biomass through superior ability of organization and ability to channel volunteer energy — using your organizational agility to always be immensely stronger than your adversaries, whenever and wherever you choose to appear, just like the army ants overpower an opponent by their ability to quickly direct and relocate their local biomass advantage. So this is the first hurdle your idea must pass: Are enough people affected by this idea, and can a large enough number of people be energized to contribute to it in order to pass the critical threshold? Can the threshold be identified, and, if so, how many people must get onboard for your idea to succeed? In the case of the Pirate Party, the trigger for quantity was file sharing. In 2006, about 1.2 million citizens — voters — in Sweden were sharing culture and knowledge in violation of the copyright monopoly and didn’t see anything wrong with that, but were still being actively demonized by the establishment. To get into Parliament, you need 225,000 votes. This meant that if just one-fourth of the people thus demonized were angry enough about it and didn’t take that kind of treatment sitting down, then the Pirate Party would be in Parliament. That was our goal, posted on the very first day on the website: 225,000 votes. It was credible, it was tangible, it was inclusive, it was world changing. Of course, there were other factors in society to this conflict as well, the underlying themes being freedoms of speech and expression as well as general net liberties. But if you start talking about abstract concepts, you’ll just have yawns among your prospective volunteers. We’ll need a large recruitment surface with concepts that are easy to relate to people’s everyday lives in order to grow the swarm to critical mass. Once inside the swarm, people and activists will strive to understand the concepts on a deeper level. We need that, too. But the surface area of the swarm’s idea must be large enough to attain the sufficient quantity of people for success. However, remember the scale of the quantities of people we’re talking about. Swarms typically engage hundreds of thousands of people, even millions. They’re operated and coordinated by some thousand people who contribute to the swarm in their spare time, and maybe — just maybe — there are one or two full-time people coordinating the bulk of it. So for the rest of this book, we are going to take a hard look at your idea of how to form a swarm and see what is required to realize it, the way the Swedish Pirate Party realized its success and started changing the world. We’ll start with looking at the launch moments of the swarm, and see how intense they can be, and discuss how a scaffolding of go-to people — officers — can be organized in order to enable the swarm all across the ground you intend to cover. We’ll be discussing techniques and methods for the swarm itself, even going down to practical things like handing out flyers and how you teach people to hand out flyers effectively. Going from there, we’ll take a closer look at how you can manage the day-to-day operations of the swarm — one portion classic project management, one large portion of wisdom about conflict resolution, and a portion of methods on preserving the swarm’s goals, culture, and values as it grows. Leadership has never been about giving orders, it has always been about taking initiative and responsibility. This sis something easily seen when a 4 year old play with a dog and clearly takes command over it, it is the initiative in the commanding that rules over the dog, not the commanding per se since such a young kid do not even have the full language for it (not only voice). As long as the kid keeps the initiative the dog will play along, for a surprisingly long time, and that initiative comes from the kids mental superiority over the dog. But as soon as the kid loose the initiative, the dog wont follow anymore, and this is the time when grown ups may have to intervene and not leave the kid alone with the dog. This is something that is often misunderstood in professional work life. There people usually do not obey out of leadership, it is usually a question of money, social comfort and so on. Ordinary middle class people with kids and payments on the house, cars and so on, do not dare to go against almost anything regarding their job, the consequences are way to heavy. So they just obey, but that is not out of leadership. A field where real leadership more commonly can be seen is in non-profit profit organizations based on free will, very much like in a swarm, but i am drawing parallels to the strict AFK world here, things that have been around since before the net, or since forever. You just can’t order around people that have nothing to loose and can walk away in split second, it takes _real_ leadership to lead such a bunch, and that comes from taking initiative and responsibility. Too bad we have not convinced you yet of the benefits of direct democracy in the style of http://www.aktivdemokrati.se (liquid democracy that combines representative and direct democracy). To me, liquid democracy is the same as swarm-democracy. It is really a gamechanger when it comes to the government of a country, and I do not think the idea is at odds with libertarian ideas that PP normally support. I would love it if you included at least some mentioning of the “swarm-democracy” in your book. There are so many interesting political movements right now. Apart from liquid democracy (that is actually swarm-democracy using your terms), there is also the idea of Land-taxation. Check out http://www.landskatt.se for more info. If PP combined many of these ideas, it could be a real alternative to the current “trojka” in power today in Sweden. You could say that in liquid democracy, swarms are given direct voting power in the parliament, and individual citizen can “override” their politicians. If we have that, we would unleash true swarm power in society! Otherwise, swarms are restricted to whatever resources/power they possess themselves. Sometimes even larger swarms can be pretty helpless if they do not hold power. Just look at the occupy movement and similar. Political change is by large impossible today, simply because most politicians corrupt “the will of the people”, and instead replace it with “the will of the few wealthy”. If we connect the swarm directly to political power, then we have a fair chance to fight the currupt powers that suppress the people and the will of the majority. you will observe in the first chapter that the first thing to do is to analyze an idea for its ability to live on its own as well as its longevity. The “direct democracy” party you talk of got 2 (two!) votes in the 2010 elections, and 81 (eighty-one) in the 2006 elections. This is not anywhere close to being a seriously viable movement. I think you got the wrong fact about our election results in 2010. Due to different spellings and hand written votes our party occurs on two places in the result (just search another step while on that page). We got 76 votes, which is still next to-nothing, but nevertheless the moevent is not quite as dead as it would be with just 2 votes. But still, yes we have not succeeded in making any impact. There are several reasons for this, but my interpretation is just that the time is not yet mature for this kind of idea. As strange as it might seem, people still seem to have some hope in politicians. But if you ask me, it is just a matter of time until that will change. Their status is crumbling by the minute. I would love to hear the arguments for that. Are you telling me that swarming is a method that does not scale? I am really interested in your answer, because we really tried to gain some attention for our ideas in the last Almedalen-event, but we were totally blacked out by media. It is apparent that no one wants this debate. I simply do not understand why people do not like to hold their own voting power themselves, or why they think it is dangerous that others do(?). What it all boils down to is that people against direct democracy seems to think that politicians are more well informed, better educated, smarter or more responsible than the general population. But given the current state of politics, that assumtions just seems to defy common sense. Other people are free to do as they like. I simply know that I will never vote for a normal party ever again. It goes against my fundamental beliefs to give away my part of the voting power to someone-else for four years, wihtout any guarantee for anything, without any say in any way. I just do not believe that the current system is a functioning democracy anymore. Another way to explain why it is difficoult to gain public interest for the direct democracy movement, is that it is a very indirect way to solve problems. People in general wants to solve problems directly. If they want food, they buy ingredients and cook some food. They do not start by building a new kitchen, constructing a new kind of kitchen tool, and then go about cooking their food in a more efficient way. The failure of DD has a lot to do with that. People generally have some direct political interest, so they want to find a political party that supports that interest. Like for example how PP fights for information freedom and personal integrity. When they do not find a political party that is suitable, they keep on looking. Or they start begging for the politicians to change their policies in some way. People just fail to realize that due to simple combinatory principles, there will never ever be a political party that represents a certain voter on all the political issues that are important to him/her. Maybe even far from it. This is why the current system creates a “vaccum of power” at the political level. The politicians know that they can break the will of the people to some degree in some issues, because the voters have no other alternative. This is what creates corruption at the highest level. But people fail to see this whole picture. They just focus on their current political issue at hand, and keep hoping that a “political-messias” or “saviour” will come that will save them. So to large degree, the problems of DD is a pedagogical problem. It is a slow starter because it takes time to explain how people and their political will gets brushed aside in the current system, and how another system would make new things possible. A lot of what you spoke of here is exactly what we did with Irish Citizens for Trustworthy Evoting (ICTE). It was started in 2003 to do something about the terrible evoting system that was being introduced in Ireland. ICTE did all of our work on the mailing list, which was open to anyone to join, and publicly archived. We wrote all our press releases (the main bulk of our activity) on the mailing list, so anyone who cared to had access to all our drafts. We considered having a separate, secret, invite-only mailing list, but we decided it was more trouble than it was worth. It was extremely successful. One year after I sent out the original email that started it all, the danger had passed. The system, which was supposed to be used countrywide that year, was put into storage. Over the years the possibility of ever using it has faded further and further, until last year when they actually sold the machines for recycling. I’m happy to hear it worked out for you! Also, 2003 is kind of early to have pursued this kind of activism. Would you be interested in the other nine chapters of the book? This chapter is well written, can’t wait until I can buy a copy. Who is the publisher? Very interesting, Margaret – I am also working on the same issue in the US. Would be good to contact you! Rick, everything you write sounds interesting! Just brilliant. I just cannot wait for the complete book to be released. I like your idea of a decentralized, non-hierarchical organization to effect political change. I believe the model could and should be used to correct many problems in our world. How do you deal with the problem of infiltration and provocateurs in your swarm of people? I moderate a politically oriented chatroom, and I am constantly having to police what we call trolls from distracting the discussion from the main theses and important concepts. Some trolls are paid shills from mainstream organizations wishing to confuse and obfuscate the information we are sharing. I look forward to pirating your book in the Summer of 2013, and sharing it in my chatroom. Some of the members will happily purchase a hard copy. Many thanks for writing it! Good question, and mine too. Leaving the door totally open allows the bad guys in. I’d be thrilled if I could do this, but I have to moderate my web pages, and there are also “difficult” activists who cause trouble for other reasons in the movement, and someone has to manage that as well. That means keeping some people out, unless we want them to derail everything. The idea and attributes of the swarm, bring to mind the open-source/free software movement. Do you plan to incorporate their efforts, experiences and achievements in your upcoming book? I was wondering… Rick, do you have volunteers for the Spanish translation? If not, I would be happy to contribute. This looks very promising. Looking forward to reading it all. Hi Strypey, thanks for sharing your thoughts! The difference between the swarm that I had experiences of and Anon/OWS first and foremost lies in ability of long-term execution of projects (say, on a timescale of years). I have seen Anon and OWS pull beautiful stunts, but they have rarely lasted longer than a week, and rarely involved more than 150 key (active) people. These are the bounds you break using the scaffolding model I describe in Swarmwise. Piratpartiet 2014, eller: det saknade kapitlet i Rick Ralkvinges bok! | Sverige är inte världens navel!